Our Lernen-Reise: Bye milk bottle! We were advised there's no need to continue giving him formula milk. And that we could try fresh milk instead. 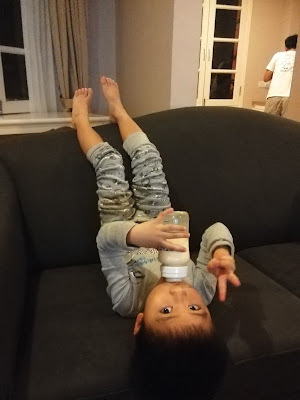 Since we told him we will just finish up the formula milk at home, he has been savouring every drop of the milk, as much as he could, from the bottle. He would prop a pillow nicely, and lie down before sucking the bottle. I can't deny he looks really cute sucking! Then a friend brought her daughter to the dentist and found decay. My friend then took the opportunity to eliminate sweets and milk bottles out of their lives. All has been good. 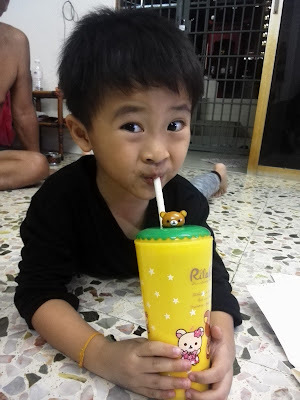 And I told myself to do it later, while thinking of all the possibilities that the transition ain't gonna be easy.. then opportunity chanced upon us..
My sister bought a cute cup-bottle with straw for IZ during our trip back to KL last week. So I told him during our trip to Bukit Tinggi, that it'd be the last night he sucked his bottle, we need to say bye bye to the bottle. Amazing how the kiddo could adapt so easily! Now, how do we wean off formula milk smoothly? The last can ain't gonna last long!